Looks like fisheries has become a new sticking point in the BEXIT negotiation. A lot of bluster over EU fisheries chief’s interview on BBC. The Brits take it as an insult. He may have just been saying the fishermen are an unruly bunch and will go where the fish are. The reaction seems to indicate the Brits are taking this as a planned EU invasion of their waters. There was a lot of criticism of the building of more River class Offshore Patrol Vessels (Infographic above) for the Royal Navy as a means of keeping the shipbuilding industry alive until the Mk26 frigates were ready to be built. It was said they were not needed and the Navy did not want them. Now they may now have a use for them. 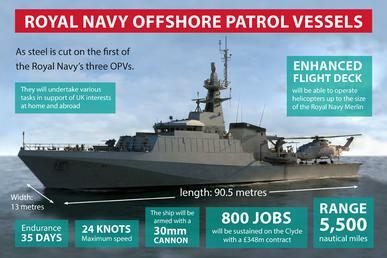 Contrary to what you see on the graphic (now out of date), they are building five of these, which will bring their total OPV fleet to nine vessels. This entry was posted in Europe, fisheries, Fisheries Enforcement, Offshore Patrol Vessel, OPV by Chuck Hill. Bookmark the permalink. This is why the UK Royal Navy should build more River class Batch 2 but I would drop the 30 mm gun and replace it with a 57 mm or 76 mm gun. It would give the British a ship stopping gun. Why? They have the Frigates to call up if ever needed, and they really don’t need the burden of standing up a new supply/training/operations budget for a new mount. Besides isn’t it too late at this stage given the Batch 2’s are currently being built to try and drop a turret system into the ship? too optimistic to think that a frigate will be available for backup. The suggestion of using the 4.5″ makes no sense, first how many of them do you think the RN/BAE have spare? Second given they are end of lifing them to replace them with a 127mm on the T26 why would they increase the numbers, and most of all, how exactly do you think you could mount it into the River’s? None of the River sub classes has anything that size mounted. I have not heard of any plans to replace the 4.5″ on the Type 45s, so they likely will be around for quite a while. Yeah the Thai’s mount a 76mm which is a different beast compared to the 4.5″. The issue of course is that it’s too late, Forth is fitting out while the construction of the other 2 is underway, I have no idea what’s underneath the current designed mount but you’d need to move that somewhere else, then deal with any issues dropping the 76mm in to a ship that wasn’t designed for it. Remember the Batch 2’s exist because the UK had to give BAE money and decided to get something for it, the RN as of now doesn’t have the budget for what you are suggesting. In terms of European operations, no the River’s aren’t going to be “hoping for 31’s” to support them, if European relations have gone that bad all bets are off. In the wider situation, given that the “31” might just be an upgunned River is there much difference? I look at it on a more Global view because one day the River class OPV’s may have to deploy as a task force with the US or NATO and having something like a 76 mm or a 57 MM would help as well. Look at the EU NATO Anti Piracy operations in Somalia. Spain Deploys their BAM with a 76 mm gun. Someday the UK maybe tasked to do the same with the River class OPV and their 30 MM gun may make them feel naked and outgunned by pirates and terrorist carrying an RPG. The creep that you are suggesting is one of the reasons why the RN is so against it. Outside of the Falklands, the only other Deployment has been for counter Narcotics in the Caribbean, in terms of anything else, that’s whats the 31’s are meant for. The RN are fairly clear about their structures. Well Eventually the UK could get pulled to do Anti piracy operations with the US or NATO and having an OPV with a 30 mm gun is too weak. For counter piracy, a 30 mm is more than adequate. My primary criticism of the class is that they do not have a helo hangar. I think this was because of their decision to accomodate the Merlin, which is a very large helicopter. If they had chosen to limit heliocopter operations to the Lynx and Wildcat they probably could have accomodated at least a collapsible hangar. I suppose it comes down to the same reason why it’s a 30mm mount as to why there’s not any type of hanger, costs. The Batch 2 order was designed for a very particular reason, the more changes to the design the more that reason became less sensible (ie to get something for the contracted money they had to give BAE). So you get this compromise hull. The design goes back to the ships built for Trinidad and Tobago. They had no distance possessions and reason to hangar their helicopter. Still seems short sighted to spend only a little more and get more useful ships. How would one of these things do as an OPC or even your Cutter X? Add a 57mm and it seems to fit the bill. If one of these is the South Atlantic Guard Ship around the Falklands, they must have some seakeeping? Back in 2010 I tried to get the Coast Guard to look at buying or leasing the three ships of this class that were built for Trinidad and Tobago but which they refused to accept or pay for. Ultimately they were sold to Bazil. I also suggested the class as an example of a possible cutter X. They would have been good as a temporary replacement for the 210′. But considering how the 270’s were actually to small for their required wartime task, I can not see these as a long term solution for a WMEC/WMSM. Even though Batch 2 will have a flight deck I still would want a permanently deployed helicopter on board if i was in either Alaskan,or Falkland Island waters. Cutter X was not supposed to be a substitute for the WMSM. The idea was to trade FRCs and a few OPC for an in between design that would give us more cruising cutters. The NI/ROI waters are going to get “interesting” at this rate, wonder how the DF will respond. Sorry Chuck, the waters around Northern Ireland and the Republic, since Irish boats are going to lose access to UK waters (including NI waters) I’d expect that the reverse might also happen. Meaning the Defence Forces (Naval Service and Air Corps in particular) may see an unplanned increase in operations there to deal with enforcing control of the waters. The move towards Brexit has already restarted some old arguments over borders/territoriality waters for example Lough Foyle (where the UK wants to claim all the waters as it’s only naviagable to Derry on the Republic’s side). So long term if this does end up with the UK leaving all the fishing Treaties I wonder how it will impact the Republic, also hope we don’t end up sinking any UK Trawlers like we did a French one back in the 80’s. The 30mm is certainly adequate for fisheries. For the Falklands, perhaps something more would be desirable. Perhaps a small battery of Brimstone? One of the Irish Navy’s P20 OPV’s once sank a French Trawler with their 40mm Bofor’s so yeah 30mm is more than enough. Why? The Falklands boat doesn’t mount them, and the Argentinian Navy is, less than capable of changing the situation, give or take a decade or two. Again you miss the core point of the Batch 2’s. It has nothing to do with their capabilities, or likely operations. It has everything to do with politics. The RN WON’T fund a new Main Gun and it’s supply/personnel chain for 3 or so OPV’s they didn’t want on the off chance that at some stage they might be needed, not when they are retiring their surface Harpoons unreplaced, have the 45 fix to do, have 2 escorts laid up due to manpower shortages, the QE coming online, the Type 26 a basket case, and the SSBN’s hovering in the background waiting to destroy their budgets. They were told to buy River’s due to the contract with BAE, so they did. that’s about it. Just to highlight the complexity of this, the Northern Irish Fishing group has pointed out that at least one of their “fleets” fish heavily in the Bay of Dundalk, Irish waters, so how this plays out long term is going to be “interesting”. The main issue is that the British Government rarely thinks about how interconnected North and South are now and while this plays very well for GB fishing groups, it does have potential issues in Ireland. Oh, so why then did the UK lead the Republic 7 billion during the financial crisis? Wow missed the point completely. The UK didn’t lend money then due to the impact on NI, they lent the money due to the ROI/UK trade (and because of the interconnection of the banking systems). However in the context of Brexit, other than “sure it will be fine” what attention was given to the question of the Good Friday Agreement? Or North South relations, trade, sustainability? Do you think anyone in Westminster is aware/cares of the cross border interconnections? Way to not understand your own position. No I haven’t agree with you, the UK funds were for GB/ROI trade, for the UK banks that were owned money by the Irish banks, and the property that the Irish banks owned in London. It had Zero to do with NI/ROI business. Just as Brexit is about the concerns of GB, not the UK. Do you get the difference between issues that affect GB (England/Scotland/Wales) and the UK? I like the Rivers. I have visited them all more than once apart from Clyde which I have never seen. Why they weren’t all built to the same design as Clyde considering the importance of the helicopter in the maritime environment of today I do not know. Especially considering their predecessors the Castle class OPVs were built with a flight-deck because their predecessors the Islands had no aviation capacity. If it wasn’t for the ‘make work’ aspect of the venture I wouldn’t go with more of the same as there are better designs to be had. I am not sure if our disagreements with the EU will end up with a Cod War like situation. The EU flounts its own rules when it suits. Going into a confrontation on the basis of preserving ‘international law’, whatever that is, whilst itself trampling over other conventions wouldn’t be the best way to win an argument, but it won’t stop them. We have to factor in the fact that the EU states have more patrol assets than the UK, and a Type 23 isn’t the best ship for the job, if we had any to spare. See Turbot War. See China in the South China Sea. Honestly they may be good for Home waters, Caribbean, and Med. But…for the Falkland’s I would want a hangar.